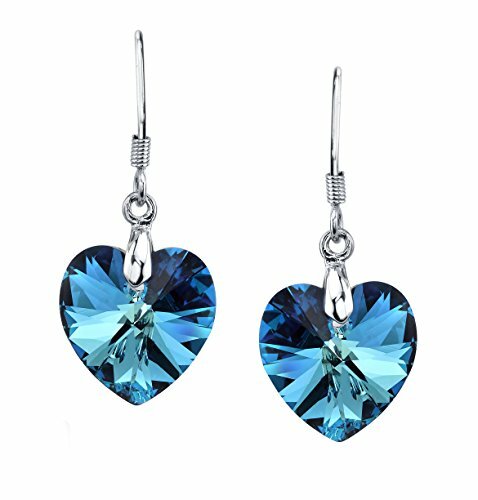 Sparkling blue Swarovski crystal heart earrings, perfect for special occasions and gifts for your special someone. WHITE GOLD PLATED - Rhodium plated for sparkling dazzle and everyday wear. GIFT BOX - Box has foam cushions on the lid and bottom for safe shipment and storage. Wrapped in a stylish mesh bag. EARRING BACKS INCLUDED - Keeps the earrings secure and less likely to fall off. If you have any questions about this product by LUVAMI, contact us by completing and submitting the form below. If you are looking for a specif part number, please include it with your message.